Fleetwood Mac News: Fleetwood Mac is waging a dicey bet that its beloved hit songs are more popular than its most vital member. Fleetwood Mac is waging a dicey bet that its beloved hit songs are more popular than its most vital member. When the band hits the road later this year, Lindsey Buckingham will not be present. On Monday, Fleetwood Mac bomb-shelled the music world by announcing it had parted ways with Buckingham, arguably the band’s centerpiece for the past 40-plus years. It wasn’t explicitly clear if Buckingham quit or was fired (although the consensus was that Buckingham was given his walking papers). In his place, the band hired Mike Campbell, guitarist for Tom Petty’s Heartbreakers, and Neil Finn, instrumentalist and vocalist for Crowded House, Split Enz and the Finn Brothers. We’ve witnessed this scenario before with Fleetwood Mac. In 1987, Buckingham left the band (creative differences) and was replaced by sidemen Billy Burnette and Rick Vito. He returned 10 years later, for a reunion tour, and remained with the band until this week. And even before Buckingham and Stevie Nicks joined the band in 1975, Fleetwood Mac went through several significant departures, including Jeremy Spencer, Peter Green and Bob Welch. This puts Fleetwood Mac among a growing group of classic-rock bands touring with replacement members. The Eagles just visited the Sprint Center with their latest lineup, which includes only one founding member, Don Henley. When co-founder Glenn Frey died in January 2016, it seemed likely that the Eagles were done as a touring band — until they announced in 2017 they’d enlisted Vince Gill and Frey’s son, Deacon Frey, to fill in alongside Joe Walsh, Timothy B. Schmit and several touring musicians. Reviews of the Eagles’ tour have been glowing. Gill is a natural fit for the Eagles’ sound, and Frey resembles his father, vocally and physically. Likewise, when Brian May and Roger Taylor of Queen hired former American Idol contestant Adam Lambert to fill in for the late Freddie Mercury (and tour as Queen + Adam Lambert), even skeptics were impressed with the results. Same with the Who: Roger Daltrey and Pete Townshend delivered a worthwhile show when they visited the Sprint Center in April 2016. The list goes on: AC/DC is down to one founding member, lead guitarist Angus Young, and is now on its third lead singer, Axl Rose. Donald Fagen is coming to Starlight Theatre later this year, touring as Steely Dan, though his co-founder, Walter Becker, died in September. The opener for that show: the Doobie Brothers, who are down to two founding members, Tom Johnston and Patrick Simmons. There is plenty of precedent for Fleetwood Mac’s move, but Buckingham’s departure feels different. For one thing, he didn’t die. For another, he is the primary force behind the band’s live shows, as a vocalist, a guitarist and a stage presence. But Campbell alone could bring in some Petty fans in need of a Heartbreakers fix. Plus there is a connection between the two bands. Petty was Nicks’ duet partner on “Stop Dragging My Heart Around,” one of her biggest solo singles. And Buckingham sang background vocals on “Walls (Circus),” a track from Petty and the Heartbreakers’ “She’s The One” soundtrack. Finn is a refined vocalist and musician who could elevate Fleetwood Mac’s sound much like Gill did the Eagles’, but he is not widely known among mainstream rock fans. The new ensemble no doubt will faithfully re-create the hits and favorites. But some things can’t be replicated, starting with the history and chemistry between Buckingham and Nicks, an often tumultuous relationship that goes back to the early ’70s and their pre-Mac “Buckingham Nicks” album. Nicks singing "Go Your Own Way," Buckingham's diatribe about the end of their romance, won't be the same with Finn on the other end. Fleetwood Mac withstood Christine McVie's departure from the band from 1998 to 2014, but her absence altered their live shows. The band performed twice at the Sprint Center during her retirement, in May 2009 and April 2013. In that 2009 show, they performed two of McVie's songs, "Say You Love Me" and "Don't Stop," her duet with Buckingham. In the 2013 show they performed only "Don't Stop." Will they cut most of Buckingham's songs from the upcoming tour? That seems unfathomable, nearly as unfathomable as watching someone else perform them. All seemed well earlier this year. In January the group convened in New York to perform after accepting the MusicCares Person of the Year. 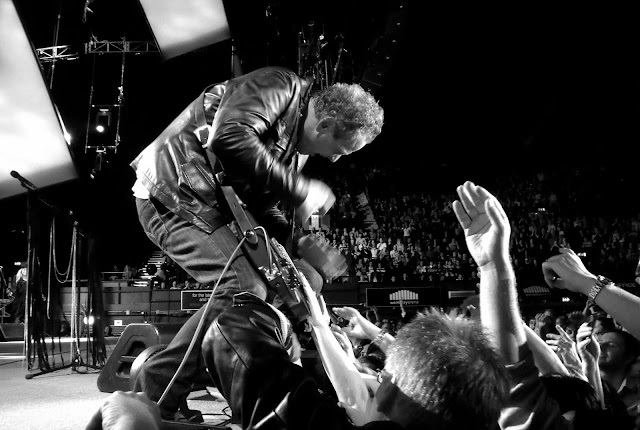 During his speech, Buckingham told the audience why the band thrived despite all the turmoil: "Not very far below that level of dysfunction is what really exists, and what we are feeling even more now in our career, which is love. This has always been a group of chemistry." That chemistry has been altered dramatically, and now the rest of the band is betting that it can go forward and thrive on their fans' love for those many great songs and the memories they arouse. At this point, the odds seem stacked against them. Stevie and Lindsey don't seem to really get along. I wouldn't go and put all that driving force behind Lindsey alone. Stevie is a force too. Sooo..how about holding a contest for tickets for the tour like Petty did. Play and sing a Buckingham song win a ticket. Band takes names and they might be surprised what they find. The fearsome five will be missed especially in light of what will most likely be their final world tour. The work and creation is essentially complete. Playing live while taxing will be no big deal with Buckingham gone. His singing is virtually unbearable anyway. Will miss the finer guitar work. But hey-Mike CAMPBELL is easily his equivalent or superior.